Sri City, January 7, 2019:- A seven member team of trainee officers of Indian Administrative Service visited Sri City today on a study tour. Mr. Satish Kamat, President, Sri City (Operations) extended a warm welcome to the officers, and briefed them on the unique features of Sri City. They all evinced keen interest and quizzed on different aspects of the business city, including the activities of corporate social responsibility. Following the briefing session, they went round the mega industrial park and visited the production units of Mondelez India and Foxconn. “We are very happy to share our experiences with the future policy makers of our country,” he added. Impressed with the infrastructure and eco-friendly ambiance of Sri City, they all appreciated its perfect planning, meticulous implementation, sustainable urbanisation principles and keenness on employment generation. 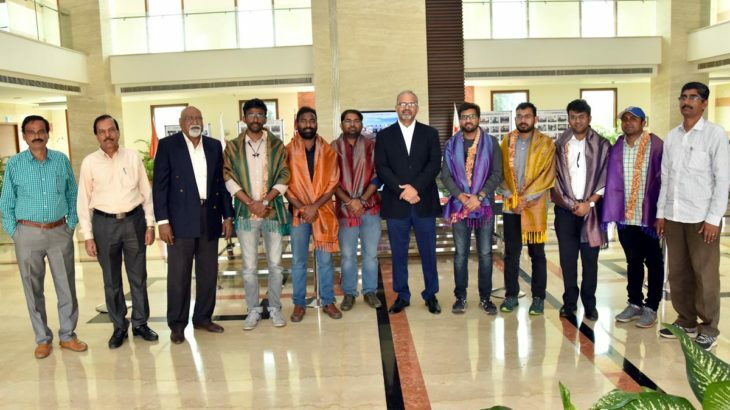 The team, which included Mr. Satyaprasad (Jarkhand cadre), Mr. Rahul Shinde (Karnataka cadre), Mr. Sai Teja (Utter Pradesh), Mr. Bhargav Teja (Andhra Pradesh cadre), Mr. Sree Harsha (Telangana cadre), Mr. Himasu Koushik (Andhra Pradesh cadre) and Ritu Raju (Jarkhand cadre) visited the place, as a part of their study tour, viz. ‘Bharat Darshan’.